The Barça women’s team have seen out the year with a 4-0 win at Malaga to stay top of the league with 41 points. Patri Guijarro scored two and Toni Duggan and Lieke Martens got the others. Guijarro’s opener, a fine strike from the edge of the area, confirmed the early blaugrana dominance, and they went on to dictate the game in every conceivable aspect. A great team move ended with Duggan getting on the end of a cross to make it 2-0 and Alexia Putellas could have extended the lead before the break, but her shot bounded back off the post. The Andalusians upped their game after the restart, but the Catalans used their famous possession game to thwart any chance of a comeback. An opportunistic Martens latched onto a clearance to put Barça three up and Patri capped a superb individual performance that also incused a strike onto the crossbar with her second goal, and an absolute stunner it was too, to round off a seventh consecutive Liga win. Málaga FC: Chelsea, Postigo, Raquel, Ruth, Encarni, Míriam, Pamela (Maria Ruiz, min 75), Leti, Mascaro (Kuk, min 60), Celia (Conc, min 46) & Adriana (Paula, min 86). 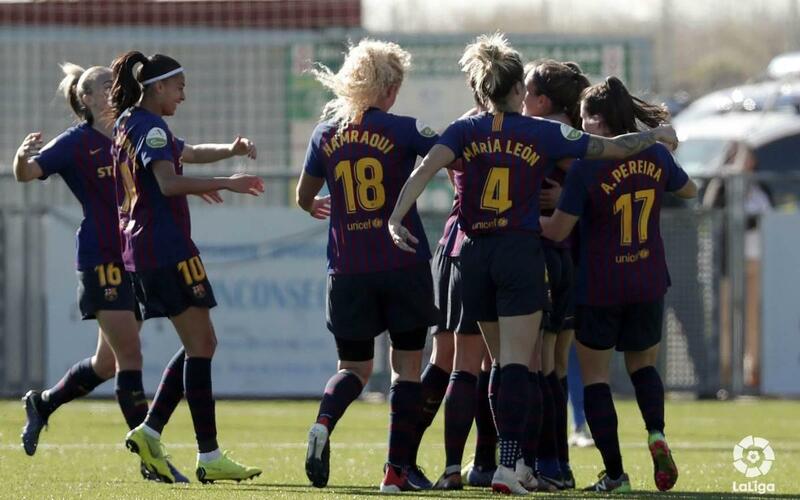 Barça Women: Paños, Torrejón, Pereira, Mapi, Melanie Serrano, Alexia (Candela, min 84), Patri, Hamraoi, Andressa Alves (Aitana, min 61), Duggan (Pina, min 77) & Martens (Andonova, min 72). Goals: 0-1, Patri Guijarro (min 18); 0-2, Duggan (min 24); 0-3, Martens (min 69); 0-4, Patri (min 79).